Are you or someone you know a young adults with autism and/or intellectual disabilities, between the ages of 18-26 years old? Then the Massachusetts Advocates for Children (MAC) invites you (or the individual you have in mind) to apply to their Young Adult Leaders Fellowship Program. 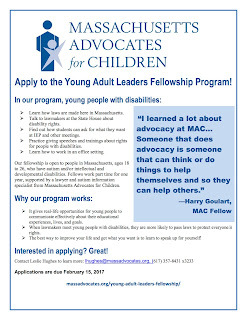 MAC invites young adults 18-26 with Intellectual Disability or/and ASD to apply for a state-of-the-art Young Adult Leaders Fellowship that offers an opportunity to learn the professional skills needed to advocate on behalf of other youth with disabilities. The Young Adult Leaders Fellowship involves a one year part-time advocacy training under the direction of the Autism Center public information specialist and senior attorney. A small stipend is provided. Check out these links for more information and access to the application!